That said, I know that libraries offer a wealth of free resources I could tap into at any time — including some things you might be surprised to learn about. They also have a wealth of resources that can help you in your job search, whether you’re in need of a better resume, interview tips, help finding the right position — or all the above and then some. 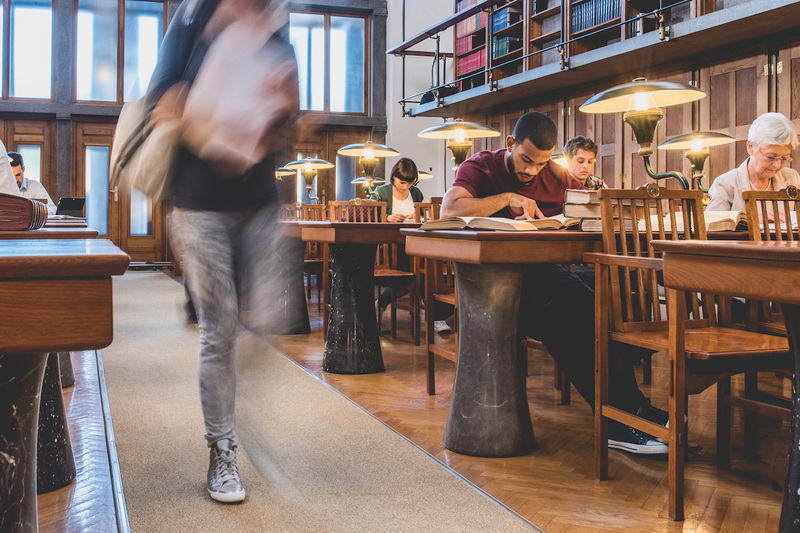 Read on to learn how your nearby public library could be your secret job search weapon. The best part about the services on this list? They’re totally free. Forget shelling out money for pricy food and drinks or wondering when you’ll get kicked out of your seat for loitering; your days of hunkering down at the coffee shop are over. A library is the perfect place to search for and apply to jobs, network on social media and more. In addition to offering computers with internet access, now most libraries also offer free Wi-Fi, which means you can take your laptop, find a quiet nook and work to your heart’s content without fear of being interrupted or distracted. Looking to transition to a different field but not sure what would be the best fit for you? Thinking of going back to school and wondering which colleges specialize in your subject area? Need to brush up on your interviewing skills? Whatever you’re looking for, your public library is chock-full of books, ebooks, magazines and more to help you find it. If it doesn’t have a particular title in its own stacks, chances are the staff can request one from another local branch. Resume templates, cover letter builders, job search databases, civil service exam study guides, salary calculators… Whatever phase of the job hunt you’re in, you’ll find plenty of tools to make it easier. Many libraries also provide on-site training in popular workplace software, like Word, Adobe and Excel — perfect for anyone who wants to add to their skill set or brush up on a program they haven’t used in a while. Check out your local branch’s workshop schedule for classes on career-related topics, like resume writing and interview prep, as well as lessons in basic fundamentals, like writing and math, that can help you succeed in any job. Career skills aren’t the only things you can learn at your public library; many provide free access to adult learning programs, like Coursera, Lynda.com and GED/high school equivalency courses. If you’re thinking of transitioning to a new field or want to beef up your knowledge to go further in your current field, this is a great way to do so. Sure, you could go to a FedEx or UPS store to print copies of your resume and scan it for online job applications — or you could do it at the library for free. We’d choose free. Remember when you were a college student and just had to stop by your campus career center for help with whatever job search struggle you were facing? Many libraries now offer the same services, including access to online education portals, career training and coaching, help completing applications and more. The New York Public Library, for instance, provides pro bono career coaching in 50-minute, one-on-one sessions. At the Greensboro Public Library, you can make an appointment with a job and career counselor for services such as vocational guidance and resume help. The San Francisco Public Library offers a regular Job Seekers’ Drop-In Lab and life coaching. Many libraries also offer access to LearningExpress Hub’s Job & Career Accelerator, which features a wide array of skill assessments, tutorials, sample resumes and even a personalized job search dashboard. Get a leg up on job seekers by taking advantage of the employment partnerships many libraries have entered into. By partnering with companies, business organizations and educational institutions on the local, state and national levels, these partnerships provide things like additional training, job placement and matching services, and networking opportunities. When you’re evaluating job offers, composing compelling cover letters and trying to find the perfect words to sum up your credentials for your resume, you need to concentrate, and that’s not always easy at home or in a public area with a Wi-Fi hotspot. Libraries are the perfect place to shut out life’s distractions and get down to business. The job search can be daunting, but your friendly, highly trained librarians are there to assist you in navigating it all. From research assistance to tech help, you’ll find a judgment-free, trustworthy sidekick whose job is to be as helpful as they possibly can. No question is too big or small, and if they don’t know the answer themselves, they’ll help you track down the best place to find it. This list is by no means exhaustive, and each public library has its own mix of resources and tools. Be sure to ask your librarian what their branch offers to guarantee you get the most of your visit. Your Turn: Have you used your public library for your job search? What resources did you find there?